Published July 3, 2015 By Anna T. This post may contain affiliate links. Regardless, I only recommend sites I've researched and/or used and trust. 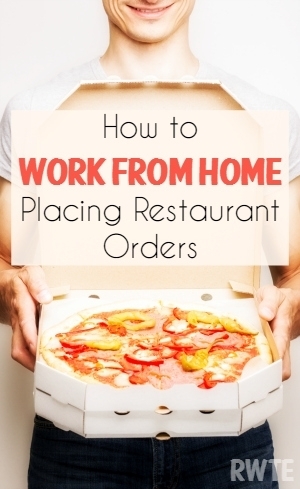 I've come across enough work at home jobs for placing restaurant and fast food orders the past year that I figured it's time for a blog post highlighting those opportunities. Most of these are highly sought-after positions that do not stay open long once the companies announce they are hiring (with the exception of maybe one on this list). So I can't guarantee that ALL of these companies will have positions open right now. Still, you you can definitely keep tabs and check on a regular basis for openings. You have to be quick in applying because as I said, the positions are usually not open for long. This company acts as a middle man between customers and restaurants. People use the DoorDash app to place orders from any restaurant in their area, and DoorDash has one of their drivers pick it up and bring it to them. It's possible to work at home as an order placer for DoorDash, working whenever you want. For most, this is just supplemental income, but it should be possible to earn between $600 and $800 per month. They only hire within the US and it's an independent contractor position. You can check Indeed or their Jobs page to see if this position is open. I've also seen it on Craigslist. To check for it there, use “DoorDash” and “order placer” as your key words. As of the date of this blog post, it's closed. You can also read our review of DoorDash here for more detail. This is a company very similar to DoorDash, where customers can call in and have food delivered to them from restaurants in their areas. And like DoorDash, they also have an occasional need for remote order placers. This is an independent contractor position. Pay is per call, paid weekly via direct deposit. From what I read on WAHM.com, you earn about .35 cents per call and the average pay is $10.50 per hour. You must work a minimum of 10 hours per week, and no land line is required. You may use any type of phone for completing the calls. Postmates does not advertise this position on their site, but I found this recent Craigslist posting advertising for it. Note that this listing doesn't say what company it is, but the wording is almost exactly the same as the wording they used the first time they were recruiting, so I think it is. If you click the link and it's expired, just do a search using the keywords “communicating order instructions” in quotes on Adhuntr (which searches all of Craigslist), and you'll find it if it's there. Another company that connects customers with restaurants so they can get the food they want delivered to their homes. NexRep is currently hiring people to do customer service from home for GrubHub. It's open to the US, with the exception of California. You can go here for details. This is another company that occasionally hires for an order placing position. If the job is open, it will appear as “Call In Order Expert.” However, the job description says you will have to work in office in addition to working from home. It doesn't say how much time is required in office. For this reason, they will only consider Maryland residents. You can go here to see if the job is posted. You can work from home for this company, taking orders for major fast food chains including KFC and Pizza Hut. Unlike the opportunities listed above, this is a company that you actually have to pay for certification, training, etc. before you can start working. However, this is not a scam company as you might think once you learn you have to pay to get started. Although that is usually a red flag, this company is one of the exceptions. You can work for them in the US or Canada. View the jobs at ContractWorld here or go here to read our review of ContractWorld. Those are all of the remote restaurant order-placing jobs I am currently aware of. If you know of more, please comment below and let us know about them, or share your experience working for any of the companies I listed above. I completed the background check yesterday Sept. 22. Today I got the email to fill out the forms. I did that, and I’m waiting for them to activate my account to start placing orders. I’ll write back to let people know how long that takes. Same for me.. I waiting on my account to be activated.. heard from them the next day after submitting the background check. My account was activated about 2 hours ago. I hope you hear back from them soon if you haven’t already. What company did you apply for? I work for DoorDash. There is a waiting list now. My background check was completed the same day I submitted it. You can check the status of your background check through the company DoorDash have you submit your info to, for the background check. Once you enter your personal info and check the status, if the status say complete you can request them to send you a copy via email. Once I requested it was sent via email right away. I want to get a spot and experience working for DoorDash before the positions is filled fast, so I forward the email that the background check company sent me to DoorDash I asked; scene my background check was completed the same day and it show clear, how long would it take for me to receive the training material and paperwork and to get started with working. I’m waiting to hear a responds back from DoorDash. I’m not trying to be pushy with the hiring process, but the positions go pretty quick and I don’t want to be left out, because I’m pretty sure they receive a lot of background checks but cant hire everyone. I know when I have questions about a company I applied for and going through the hiring process, I look online for answers, so I thought maybe this would be helpful to a lot of people that got to the process of DoorDash requesting them to submit a background check. Below I would copy and paste the email the background check company sent me, on how to check the status of your background check and request a copy. Just and case if anyone waiting on the results of there background check you can check the status on your own, while you waiting on DoorDash to contact you back with a responds about you moving forward after the background check process. Hope this help wondering minds. Thank you for contacting us at Checkr, Inc. We are happy to help answer any questions you have about the process of your background check, and are glad for the opportunity to do so. Checkr is a consumer reporting agency and does not participate in the determination of your candidacy for a position with the company you applied to work with; we provide the background check, and the company’s team, NOT Checkr, makes a determination regarding your application. Please visit applicant.checkr.com to get an update or to receive a copy via email if it is complete. If you believe there are inaccuracies in the background check that you have received, please send an email to disputes@checkr.com. PLEASE BE PATIENT AS WE WILL REPLY TO THIS EMAIL AS SOON AS POSSIBLE. Checkr’s Customer Support hours are 9:00 am – 4:00 pm Pacific Time, Monday through Friday. Below are the details of your message; a member of our team will do their best to respond to you within 24 hours Monday-Friday. I applied yesterday 9/21/15, got a email almost right away to do the online assessment application. I completed the online application the same day, then the next day later in the evening I got another email telling me that they want to proceed with the background check, and after that I would receive the training material and 1099 etc… I submitted my background check today 9/22/15. I was wondering how soon would you hear back from them after submitting the background check, to get started with training and to begin working? If someone can answer my questions it would be very helpful, to have some clue of how long would the hiring process take in all, thanks in advance. I also did my background check on the 22nd. I got an email back today saying they would like me to get on board with them. The training will come with that email if they offer you a position. You have to sign a few things and then wait for them to activate your account. I’m waiting on the activation as of now. How soon do you hear back from DoorDash, after they send you the email to do the online assessment application? I submitted mine yesterday, now waiting to hear back from them.. Do anybody have a idea of how long it might take for me to hear back from them, after completing the online assessment application? Can someone tell me how doordash pays out? It’s direct deposit, I believe I read that it’s weekly. I applied to Postmates and DoorDash last week. On Thursday, DoorDash had me do an online assessment. On Friday, I had the telephone screen from Postmates and was welcomed aboard and was told I will be receiving an email but Imy not sure for what, the screener was difficult to understand. Hours later, I received an email from DoorDash and was invited to work for them after passing the background check. I completed the background check a few days ago. I’ve emailed both companies and they said my information is being processed but didn’t say how long until I can begin working. Can someone enlighten me to the process and time frame to begin working. Thanks! I also finished the background check with DoorDash and haven’t heard back from then either. I heard back from them the day I posted my question here. The sent me the online training materials, W-9 and direct deposit forms. Now I’m waiting to hear back from them to let me know my account has been activated and I’m given the go ahead to begin working. Have they activated your account yet? If so, how long did it take? I just got the email today saying to wait until my account has been activated. Just wanted to know since your comment was a only a week ago, and you’re at the same spot as I am now. I hope it doesn’t take too long. Thanks if you can give me any information. Good morning. I tried grubhub with no luck, as well. Keep looking out for DoorDash openings. You don’t have to live in an area where DoorDash delivers. There are any in Louisiana, where I am from, but I place orders for all timezones. Good luck in your search! What is the the name of the job on Door Dash I actually didn’t see order taker listed only for drivers. Currently, there aren’t any openings. But I suggest checking back frequently. The position will be listed as “order placer”. Openings go really fast once they are posted. But, from start to finish, once they respond to you, goes really quick. I did everything in about one week. Do they require a land line telephone? we have Cell phones, don’t want the hassle of a land line lol. I am happy to report that I was hired by Door Dash! I just received the notice that my account has been activated. I will definitely return to give an update once I have completed a few hours of work with them. I just got hired today. Waiting for my background check to come back. I have been working for DoorDash for about a month as an Order Placer. I absolutely love it, and it is perfect for me. I need something totally flexible, with no set number of hours etc. This, is it! I work in my own free time. And yes, the pay is $.50 per order. They have some awesome incentives on the weekends and holidays and around big sporting events. Definitely don’t rely on this as your only source of income. Only use it as a source for some extra spending money. That’s what I do, and it works out great for me! I definitely would recommend it to others, when it’s open for applications, that is. There is also this one but I don’t know how good they are. I have a friend that just started with them. They are called “Order Up” and here is the link http://orderup.applytojob.com/apply/ The position is called “Call in Order Expert” I have a friend who just started with them not long ago and she likes it so far. Helena, in the second paragraph of this post, Anna explained that the positions go fast and that she could not guarantee that any positions would be available. So if you’re not seeing anything available, they’ve either closed the job listing or have not posted vacancies yet. You’ll have to check back very often because the job listings only stay open for a few hours due to the overwhelming response. I don’t see anything about an order taker position on their site? What am I missing? Regarding DoorDash, you MIGHT, POSSIBLY make about $10-15/hr, but it depends on a few variables & even then every hour you work, you can make different pay. The pay is technically 50 cents per completed order. Definitely do not depend on this job for any main income…more like just a job to squeeze in amongst your others for a bit of extra cash. They’ve still got a lot of kinks to straighten out. There’s a big chance your pay will be incorrect and/or you’re waiting forever even when the pay days have long passed. Thank you for this information. I really need to find another job and this does not sound like it will meet my current needs. I applied for Door Dash yesterday. I really don’t want a phone job but I’m not having much luck finding another non phone job. Anyways, I’m hoping background noise shouldn’t be a problem with this type of gig since you are placing orders. I live in a noisy apartment so that’s one reason why I don’t want/can’t be on the phone.